There are many good, quality deep fryers on the market. You may already own one, you may have your eyes set on one, or you may even be selling one. I’m not here to tell you what to buy. I’ve heard that some of you absolutely love Chefman’s deep fryer, which is really good. What I’ve done is that I’ve studied your preference and I’m here to analyze it and see if it has merit. This means that I might not succeed in swaying your thoughts if you’re strong enough, or I might convince you to go for this product. The end result will be a product of your understanding of this review and this will make you the real champion as far as this review is concerned. Before you ask, no, I’m not going to tell you how it works or how to use it. What I am going to do is I’m going to tell you all about this product in this exclusive Chefman deep fryer review. I’m going to tell you the basics of the different models, their pros and cons and if this product is what you need in your life right now, great and glorious. If it isn’t, well, maybe you’ll need it next year so I’ll still encourage you to read on. You never know. Why do you need a deep fryer in the first place? Yes, I’m familiar with your very healthy mindset. Deep fryers represent everything greasy, dirty, oily and definitely not healthy. So why would you want to invest your money in something that is potentially dangerous? The first reason is that it’s an investment, and everything that is an investment has the potential to be both good and even better. Has it ever occurred to you that the reason you so hate the deep fryer is that you’re using the wrong kind? Think about it. You’re using the old fashioned, really messy, totally unappealing kind of deep fryer or worse still, you’re frying out of a regular deep pan. No wonder you hate it so! The right deep fryer will just sort of make you feel calm and better about frying. Imagine if you had a stainless steel deep fryer for example. How could you not want to fry? I dare you to try it if you’re in doubt. Every home needs a quality deep fryer. This is the second and most important point. It’s simply a must-have if you want a nice, peaceful, happy life and especially so if you have kids. Would you rather your kids eat greasy foods at fast food joints where you can’t control the oil level or would you prefer they eat a controlled, somewhat healthier version of their restaurant favorites at home under your watchful eye? And it’s not just for kids. Just think about all the money you spend on game nights getting snacks ready for the gang. You may not indulge in all that grease but one or two members of your gang probably do and for friendship sake you have to indulge them. If you had a deep fryer at home, you could cut down severely on the expense, save your friendships and control grease. You win! I keep saying that with a quality deep fryer, you can control grease. Let me explain how. If your deep fryer is so deep and electrically controlled with a built-in thermostat that regulates the hotness of your fryer and trips it off wherever necessary, thereby making it safe and also comes with a lid so you can cover up while frying to prevent any oil splatters. Wouldn’t that eliminate your grease problem? Do you now see the reason why you need a quality deep fryer? Good. Now that that’s cleared up, let’s go into the review proper. Chefman Fryer: The Best Deep Fryer? While it’s not very big, if you’re frying for a vast number of people, it is perfect for personal use. Great for individual use on smaller kitchens as it can fit anywhere and doesn't need much oil to fry. It can accommodate a great load in one go which is great for a large family. 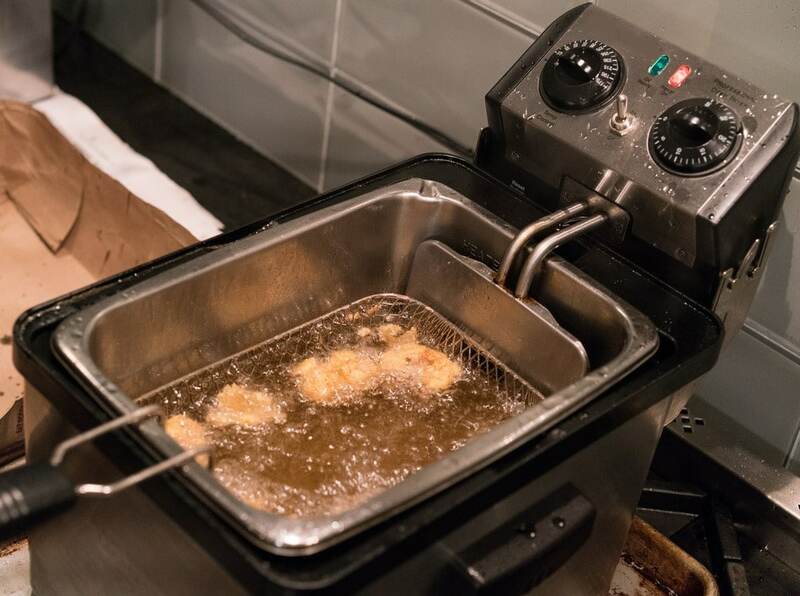 The Chefman deep fryer with a basket strainer is perfect for frying chicken nuggets, shrimp, French fries and everything in between. But is it worth investing in? Chefman deep fryer comes in two popular categories: fry guy deep fryer and the four (4) liter jumbo size deep fryer. But there’s also one not-so-popular deep fryer in between the two sizes. The Fry Guy Chefman Deep Fryer has a one (1) liter capacity and a stainless steel cool-to-the-touch exterior that is both big and safe. The liter capacity allows several servings to be fried at a time which reduces time and effort, and the stainless steel body keeps the fryer’s outer surface from being too hot. 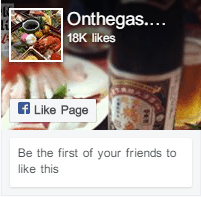 While it’s not very big if you’re frying for a vast number of people, it is perfect for personal use and then some. 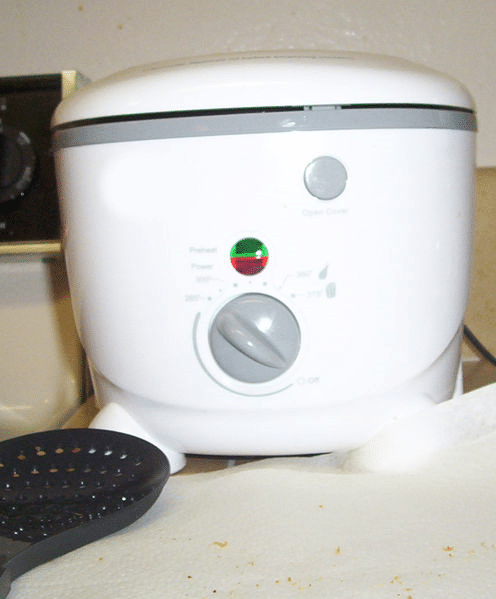 It is an adjustable temperature deep fryer with a removable oil container. The fry guy has an easy to turn knob rotary dial that allows you to adjust the temperature at will for faster frying so your meals always come out crispy golden instead of brown and burnt. The oil container can be removed and cleaned separately without distorting the whole unit in the process. It is just the perfect, cute, portable size with its removable baskets and foldable handle that can fit easily in your kitchen. And the stainless steel makes for good aesthetics too. In addition, it is super easy to clean with its non-stick inner coating and the clips on the side of the fryer that allow the oil to drain without making a mess. I repeat, without making a mess. Talking about safety, the fry guy deep fryer is cETL approved and PTFE free with advanced safety technology and long lasting durability. It is dishwasher safe and a 1,000watts power output. This deep fryer is perfect for making donuts, fries, onion rings, chicken nuggets and virtually anything fried your mind can conceive. The 1 liter capacity is not large enough especially if you have a large family and do a lot of frying. This deep fryer is not as popular as the fry guy although it shares most of the same features. It is made of stainless steel and has a rotary knob for adjusting the temperature. It comes with a removable oil container and a 1500-watt heating element that fries food fast and well. It also has a magnetic breakaway power cord that ensures safety. 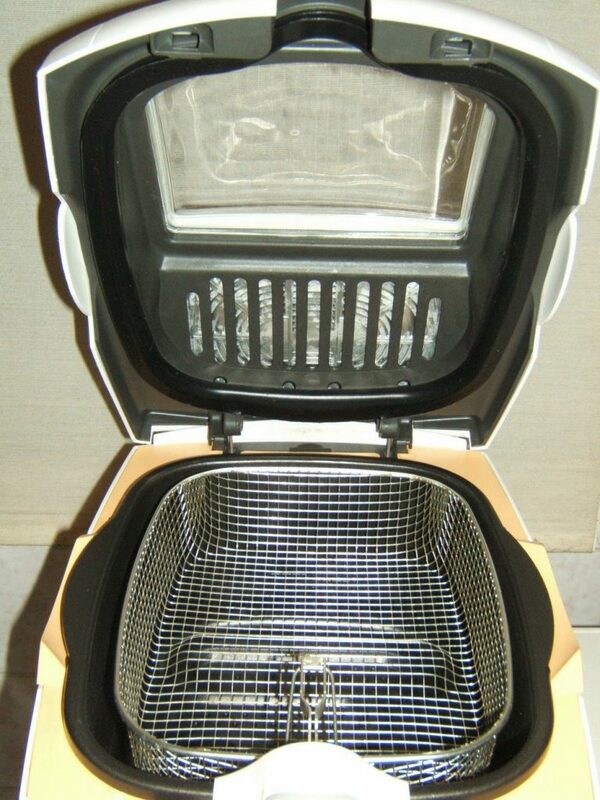 It has a charcoal air filter that allows clean, crisp frying with a wire basket that has an exterior handle. This eliminates spatters as the food is being lowered into hot oil. At 3.4-quart, it still is quite small and not ideal for family-size. This is the jumbo size deep fryer made by Chefman that everybody is talking about and it’s easy to see why. It has four times the capacity of the fry guy! This should take care of the capacity challenges that the fry guy has. Just like the fry guy, it’s a deep fryer with a removable oil container and rotary knob for adjusting the temperature. The temperature is gradated in Fahrenheit and can easily reach 350⁰. It also has a built-in timer which is another control knob that controls the working process of the deep fryer. This jumbo size deep fryer has a large basket that can hold a great quantity of food and has a 4 liter capacity which can easily fry food for a medium to large gathering in reduced batches (no more cold food because of delay!). It has 1700 Watts power output which is really good as it’s close to the maximum power wattage for most U. S. homes. This combined with the large oil pot size is a really good combination. 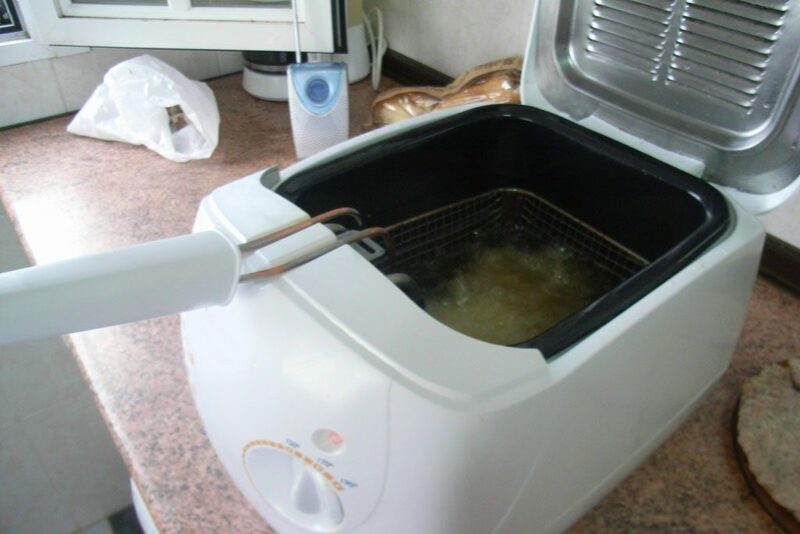 In addition, the deep fryer uses a detachable power cord that is connected to the heating element and comes with an instruction manual that lists the best temperatures and times for frying different sample foods. The heating element consists of the heating rings and the control knobs – the temperature and timer knob. The detachable power cord is connected to the heating element at the back. The heating rings have temperature senses that help keep the frying temperature even. The power plug is polarized and has a 15 AMP U.S. fuse. The deep fryer comes with a lid that is both dishwasher safe and prevents oil splatters. The lid has a little peephole on the top so you can easily check on your food with the aid of a flashlight without having to physically open the lid. The oil container, heating rings and stainless steel basket or strainer are easily removed and easily cleaned. There are minimum and maximum markings on the oil container that let you know the highest and lowest limits when pouring in your oil so you don’t go overboard. This unit has dimensions 15.4 x 14.8 x 9.3 inches and a 1-year warranty provided by Chefman so you can always get your money’s worth. It is cETL approved with advanced safety technology for long lasting durability. Product weighs 9 pounds (about the size of a very heavy newborn baby) which is quite lightweight for an appliance. Notwithstanding, there are some downsides to this piece of machinery. The timer and temperature settings regulate your frying which frees you up to do something else. When the timer goes off, your frying is done and you can take it out. You don’t have to stand there and watch your food physically. The attached instruction manual that has the suggested temperatures and times for frying different foods is a really good, needed guide for first timers and even seasoned pros can benefit. The power cord is detachable and can easily be flung out from the heating element in case of emergency. The size, although large enough for home use cannot function as well in a commercial setting. This deep fryer is not straightforward to use. You can’t just turn it on and start frying. You will need to set your temperature and timer knobs and this may require you to read the manual to know how to set it up. You can only use one type of oil when frying a load of food. The make-up of the fryer doesn’t allow mixing of different oils. The lid of this deep fryer is not lockable. This makes it somewhat unsafe and could be very dangerous for kids when it’s in use. The Chefman deep fryers are a group of large capacity deep fryers that excel when it comes to medium to large scale home frying but don’t do too well when it comes to commercial frying. The stainless steel is good for aesthetics and keeping the hotness of the fryer relatively contained. The removable oil container and basket are good, but not uncommon. The Chefman deep fryer does not have any particular extraordinary feature, but it does its job well as a home deep fryer. And so do several other brands in the market, some of them at a cheaper cost. If you’re going with the Chefman brand, however, you may face the challenge of going for the fry guy, 3.4-quart or the jumbo size. If you won’t be doing a lot of frying and your load won’t be much, the fry guy is your best bet. 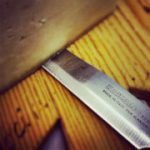 This also goes if you have a small kitchen. 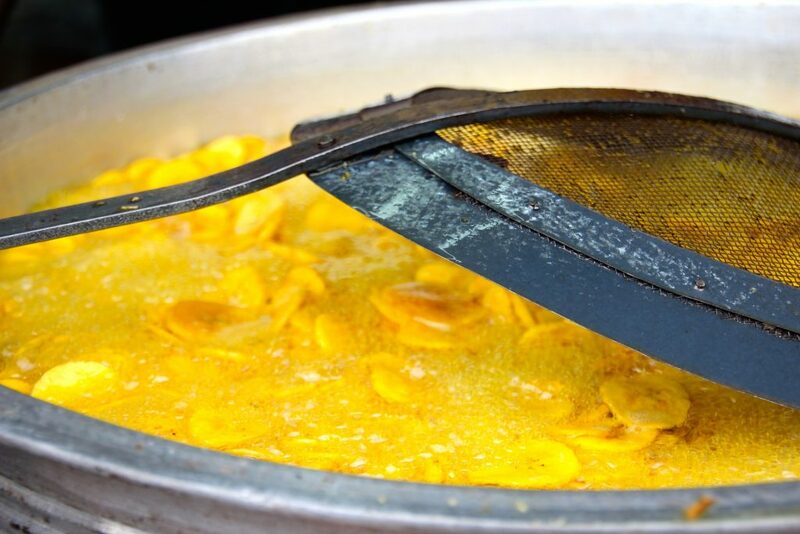 If yours is larger and you’ll be doing more frying for a greater number of people, go for the 3.4-quart or jumbo size. Some of the jumbo models come with two baskets – large and small, so if you happen to see one of those, go for it. Are you feeling the urge to fry yet? Do not hesitate; quickly go get yourself one of these and you’ll be the happier for it. Make all the fries and nuggets you want right in the comfort of your home with the Chefman deep fryer, and don’t think too much about the calories and cholesterol. They always have a way to burn themselves out. Happy frying!